COLUMBIA, Mo 4/20/16 (Beat Byte) --Thank God for Alex George. In a world starving for alternatives to video-based entertainments -- games, TV, movies, Netflix, House of Cards marathons -- the author and Columbia resident brings a festival that could become the True/False of books. That's right -- books, those slender-to-hefty written repositories of art, history, life, imagination, and the sum of all human knowledge. Some are bound with a sturdy spine, others unbound -- on iPads and Kindles, and this Saturday at George's new event, the Unbound Book Festival. "Unbound" isn't just clever wordplay, but an apt description of what George and his fellow organizers want to do: transform the usually quiet, solitary act of reading and writing books, if just for a day. "We believe that life should be a conversation, and so every event at Unbound will be wildly interactive," he explains on the festival website. "We have all manner of unusual events planned. Our festival will be innovative, different, stimulating and – above all – fun." Unbound's day-long schedule has something for everyone: fiction, poetry, and non-fiction lovers; childrens' books and authors; panelists; performances; and above all, "multiple chances to meet and speak with your literary heroes." The over two-dozen authors and poets in attendance couldn't ask for more high-energy introductions than those George and his team provide. Fans know their favorites inside and out, but for those less familiar with certain writers, the introductions pop with praise and detail. Take this entry on the poet Mark Doty, who won the 2010 National Book Award. "Doty is one of America’s most acclaimed and beloved poets. His gorgeous, colloquial verse touches movingly on matters personal, natural and political, oftentimes weaving together these realms with wisdom and grace. He is one of our foremost writers on the AIDS crisis and the ongoing hazards of being gay in America, yet is also renown for poems of landscape and flora, and is unmatched in his writing about the relationship between humans and their dogs." "The English Patient" author Michael Ondaatje officially kicks off the festival Friday night, in conversation with the Doty at the Missouri Theatre downtown. Like the festival Saturday, the Ondaatje-Doty conversation is free and open to the public, but does require reserved tickets. It's been sold out for a while, but George has encouraged those without tickets to form something of a Q line to fill in for no-shows. Among Saturday's highlights: a First Page Rodeo, kind of an American Idol for novelists. Few people are better qualified than George to put together an event like Unbound. 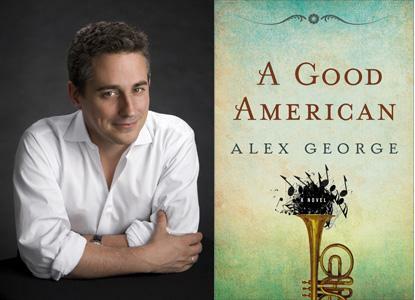 Best known for his 2012 novel The Good American, he's been a writer most of his adult life, achieving "overnight success" after many years of hard work -- and paying the bills with a day job as an attorney. “He gives a lot of himself to his community, his kids and his passions,” Cindy Mustard, retired executive director of the Voluntary Action Center, told Vox Magazine for a 2011 profile. George has just delivered another novel, Flight Risks, to publisher Penguin Books, and with Unbound, hopes to deliver "one amazing day of bookish joy every April" that supports a larger mission. "The Unbound Book Festival pledges to support the drive to improve our state’s literacy rates," the festival's website says. "Books, after all, should be for everyone."